Hobart is the name of a trusted, well-established brand for welding machines. The product Hobart handler 190 is well capable of welding steel and aluminum. The device might seem small, but it packs a lot of power inside. This machine can be one of the best choices regardless of whether you are a beginner or a professional. It is robust and reliable and very simple to use. 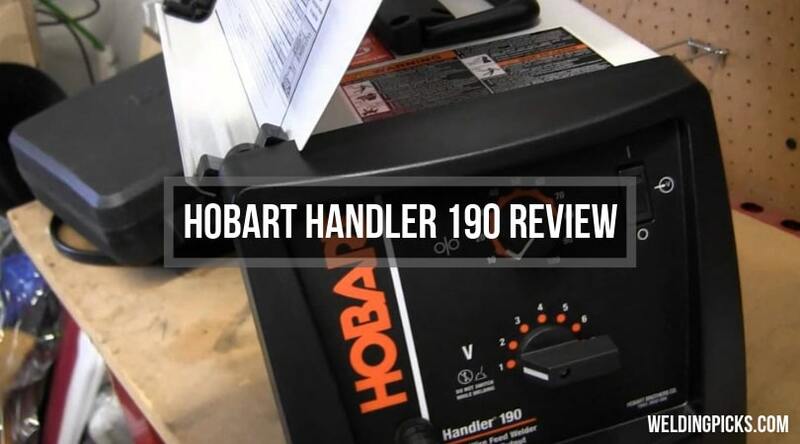 In this Hobart Handler 190 review, we will see why this machine can be an excellent low-cost option for welding. We will look at the features of the product, the pros, and the cons and why this might be a suitable option for you. 2.1 I’m not a professional, I just weld sometimes for my household needs. Will this be a good option for hobby projects? 2.2 Can you use a generator for the power supply? 2.3 It says “assembled” in USA. Where are the parts made? 2.4 Do you have to use gas while welding? 2.5 What is spool gun and why should I use it? As you might have guessed from the size of this machine, it is designed not for any industrial use at all. Do not, however, be tricked by its size. It packs a lot of power to do almost any massive-duty job you might have to lay around at home. This machine can weld materials of 5/6th inches of thickness. It comes with a mechanical gun that can be used for much better control on thinner aluminum. The unit can be powered by regular electricity or by any generator, making it perfect for anyone who needs a mobile unit. Down here, we will look at some features of this MIG welder that makes it a perfect choice for everyone to use around the house. The seven levels of voltage selections, and unlimited wire feet control allows this machine to be very simple to use by setting up the natural parameters. Having better control makes it much more efficient and the results much better than other welders. It also produces less spatter even on higher controls, thus allowing cleaner and better bead shapes. The machine comes with a built-in wire feeder, unlike some other machines that requires you to use external wire feeders. The figure adds up to the simplicity of the overall design of this machine. This allows it to have a quick release lever and faster perforation. Hobart is famous for its top welding machines. Durability is one of their strongest features. Having multiple groove drive lets you switch between different wire sizes while working. This machine has double groove drive rolls as well as various wire feed controls. The combination of both these features make it easy to do varying levels of work. Welding is a risky job and if you are not very careful, you will be exposing yourself to a big heat hazard. Luckily, Hobart handler 190 has a solution for this. They put in a built-in wire sensor that cools down the wire by using electricity. These types of welders are mostly used for welding steel, but this MIG welder can weld aluminum with the default settings. The issue with aluminum is that it is a thin metal, and if you do not strictly control the power level, you will create a mess. However, there is a pool gun made specifically for using externally with a MIG welding machine; you can find something like that easily on Amazon. The device is portable and safe to carry. It has a handle set on top of it, but maybe the best would be to use a wheeled cart for maximum safety. I’m not a professional, I just weld sometimes for my household needs. Will this be a good option for hobby projects? Yes. Hobart handler 190 was designed to be used in Automotive, construction, and any home uses. Can you use a generator for the power supply? It says “assembled” in USA. Where are the parts made? Miller makes Hobart products. It’s all made in America. Do you have to use gas while welding? You can, but it’s not mandatory. What is spool gun and why should I use it? Because aluminium is more fragile and thinner than steel plates. Spool gun allows the user to get more control over the wire feeding to keep the aluminum safe. 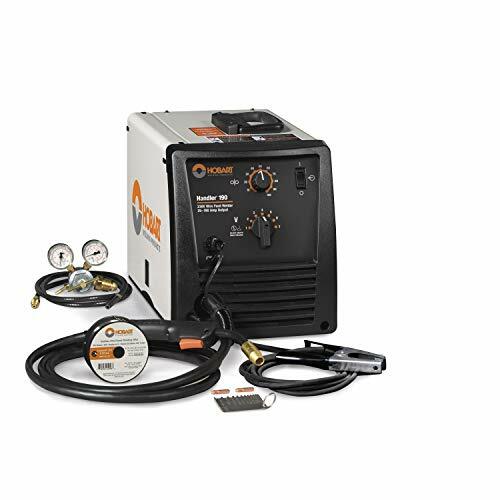 Whether you are a professional or an amateur, if you are looking for a solid, professional-quality MIG welder, then this can be a very good option for you. This product has a good record with users, and it has fame around the world for being too simple to use and for being durable for years. After checking the market prices of various welders, you might think that this is too expensive, but then again, good things don’t come cheap. So just give it a shot, and you won’t need to bother looking for a welder for the next few years ahead.